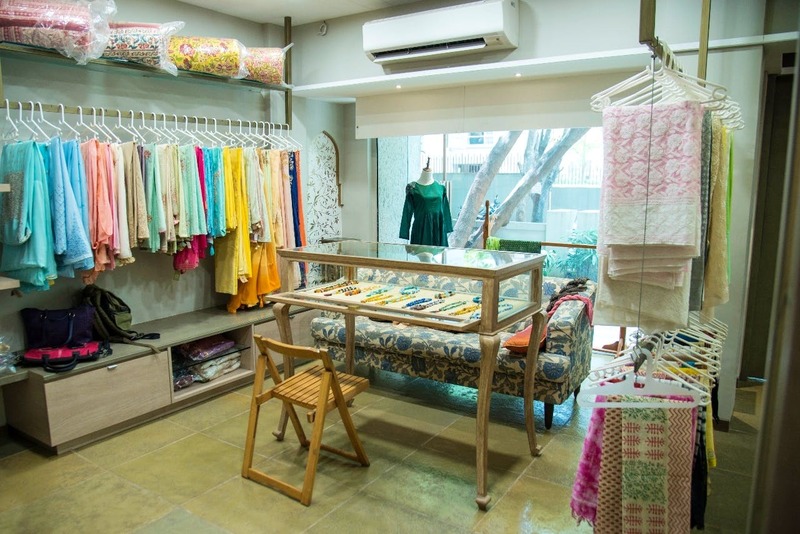 The brainchild of Sonia Somji and Harsha Bafna, Atasi is a hidden gem of a boutique, located inside a quiet lane of Kalyani Nagar near Carnation Society. The store is a quintessence of elegance and sheer sophistication. Imagine a quaint bungalow turned into a gorgeous studio with walls that adorn soft, grey tones and floral murals, handpainted to perfection. The wooden finish on the cabinets and rails add to the overall gracefulness. What's even more eye-catching is the collection of apparels, home decor, and jewellery that takes away the limelight entirely. Sonia tells us the boutique revamps its collection every three weeks whilst keeping up with the changing trends and season. Currently, Atasi boasts of pastels, subtle English palette, a brilliant assortment of fabric and chic silhouettes. As for us, we couldn't take our eyes of the Lucknowi chikan work on pure chanderi, intricate applique work on salwar pieces, flawless Kutch and Mokaish karigari on fabrics, delicate mirror and tassel detailing on dupattas, flowy cocktail gowns in royal wine and emerald hues, and the extensive collective of Kota silk sarees. And, the best part? As expensive and luxurious it may sound, in reality, Atasi's clothing line starts from INR 2,000 and go up to INR 20,000. In a nutshell, this place is for every kind of budget, every kind of shopper, and every kind of taste. Atasi also keeps a wide range of jewellery, starting at INR 1,250. Go here for amazing Belgian mother-of-pearl sets, statement neckpieces, chandbalis in silver and precious stones and contemporary chandelier earrings. For home decor hoarders, Atasi's range of Jaipuri razai, bedsheets, table mats, quilts, and comforters are a must to check out.